The Greater Manchester Combined Authority have just published a series of plans for the future of our conurbation, dealing with housing, economic growth, the environment, air quality and transport. Put together they are the most comprehensive collective strategies the city-region has seen since the days of Greater Manchester Council and in many ways, this cross-council cooperation brought about by devolution is to be welcomed. Take housing. The Government has indicated to each council precisely what their housing growth figures are. For an area like Stockport, which is very tightly constrained by protected greenbelt, these targets would have seen large swathes of this land swallowed up. Now there’s still going to have to be some greenbelt given over to future housing need, but by working on a conurbation-wide basis, Manchester and Salford (where they have lots of redundant brownfield land and are keen to build high density and upwards) have taken a chunk of Stockport’s share. 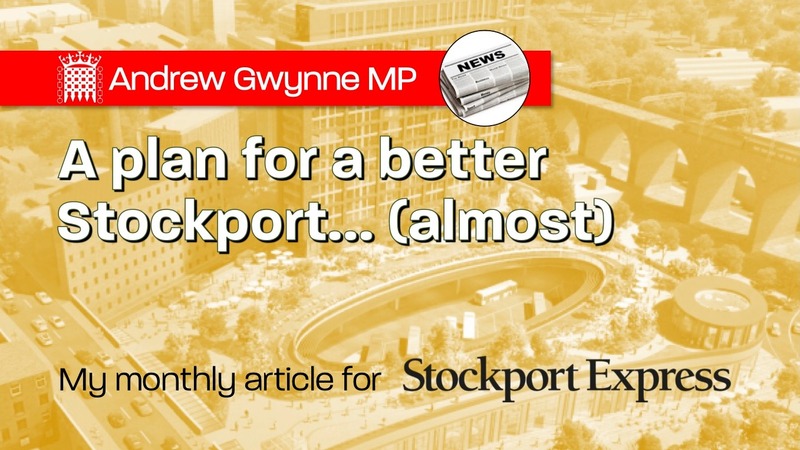 The Mayor’s emphasis on Town Centre regeneration, too, is to be welcomed; especially given Stockport is going to be the first to use Andy Burnham’s new planning powers with the creation of a Mayoral Development Corporation to steer through the changes. On transport, there’s an emphasis on extending the Metro to Stockport – not just with bespoke Metrolink extensions, but also by utilising the existing rail infrastructure across the borough by running Metrolink trams on the railways too – the so-called Tram/Train. There’s even a glimmer of hope for passenger services through Reddish South and Denton stations too! All this, if it comes to fruition should also help tackle Greater Manchester’s (and specifically Stockport’s) chronically bad air pollution problem. It’s on economic development where I’ve got an issue with the Greater Manchester plans, because it’s obvious to all that on this issue, the ten councils aren’t working together as they should be. Together they’ve put forward an oversupply of land for industrial use, including some very large greenbelt sites. I’m vehemently opposed to the proposed extension of the Bredbury Parkway industrial estate deep into the Tame Valley. This scheme goes completely against the environmental, transport and air quality plans also put forward. It will also destroy two beautiful local Nature Reserves in my constituency – and it’s unnecessary in a Greater Manchester context. I hope, on this, as the consultation proceeds, that common sense will prevail.